This sweet and spicy pimento cheese bread has it all! 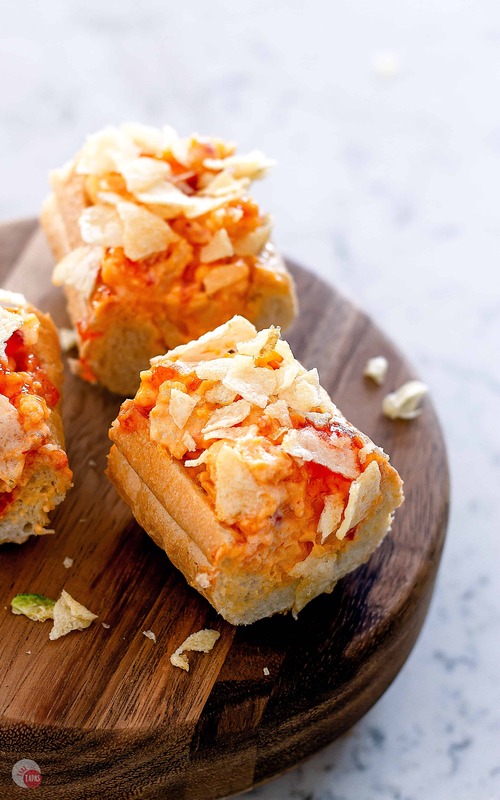 Pimento cheese, sweet and spicy pepper jelly, and topped with crunchy kettle chips for texture! I was introduced to this pimento cheese bread when my husband Brooks and I were in Jacksonville recently. We went to The Players Championship at Sawgrass and watched some golf for a few days, did some shopping, and had a night out without the kids. Gotta have a date night! I never watched golf on television until I met Brooks and he made me go to my first golf tourney. Every time it came on the TV, instant nap time. Watching golf on TV could get me to go to sleep faster than a double Nyquil shooter chased with a few Benadryl capsules. Brooks dragged me kicking and screaming (quietly) to my first live golf tourney, and I have to say, that watching it in person is TOTALLY different. Just take me to the Pimento Cheese Bread Recipe Already! 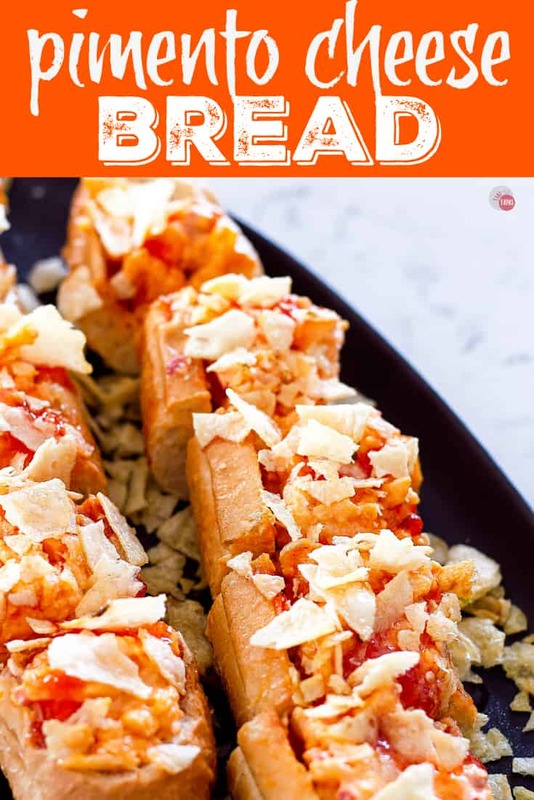 If you’d rather skip my (very helpful, I think) tips and tricks, essential cooking info, and similar recipe ideas – and get straight to this delicious easy Pimento Cheese Bread recipe – simply scroll to the bottom of the page where you can find the printable recipe card. Once we were done watching golf for the day we did a little shopping. Brooks loves to buy clothes and the only stores we have in Waycross are JC Penney’s and TJ Maxx. Not the best choices, so we like to hit the stores while we are in the big city! Once I had changed my clothes a hundred times in tiny dressing rooms with unflattering mirrors, I decided to stuff my face. Right next to where we’re shopping, Moxie! We have passed this restaurant a few times and thought it looked great and on the recommendation of friends who have been there and raved about their drinks, we decided to pop in. Happy hour was just about to end so we decided to order two rounds of cocktails (the first ones go quickly) and some tapas. We were so hungry that we didn’t stop at TWO tapas, haha, we ordered three. Calamari, pimento cheese bread, and a charcuterie board. The calamari was tender and crispy, the charcuterie board had great salami and Manchego, but the bread was unlike anything I have had. I had to recreate it using the original as inspiration! 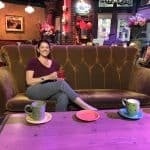 If you are in Jacksonville, you have to go to Moxie! The drinks are fabulous (I had my first French 75 there), the food is even better, and the chef is a two-time James Beard Award nominee! 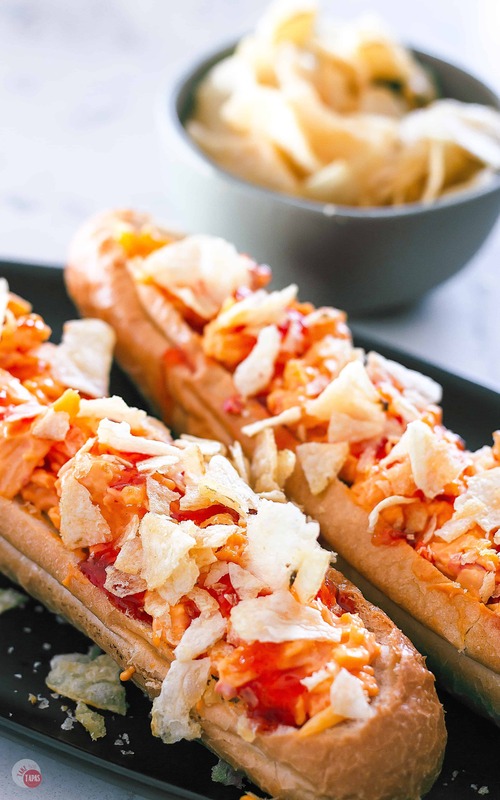 French bread, pimento cheese, pepper jelly, and potato chips. The Pimento Cheese Bread was crisp and the inside had a great chew. The pimento cheese was creamy and had a kick to it from the jelly. The crunchy chips just topped it off perfectly. I ate the remaining slices and left Brooks empty-handed. Gotta be quick around me! My first thought was I need another loaf, the second was I need to put this on the blog so everyone can try this! 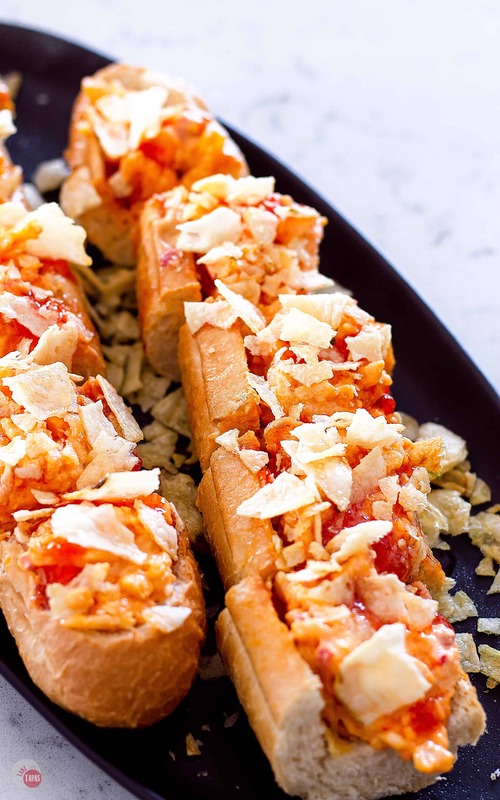 And what better than a hearty and delicious French Bread appetizer to share with you guys? It’s quick, easy, and can be semi-homemade if you are short on time! This pimento cheese bread comes together in less than 5 minutes and you can make it with items from the store if you are in a hurry! You can also make it completely homemade if you have the time. You can use my pimento cheese spread and my 4 pepper jelly as a starting point. Q: Do you have to toast the bread beforehand? A: You don’t have to but toasting the bread not only warms it but the toasty inside keeps the pimento cheese from making the bread soggy. Q: How long can will pimento cheese bread last? A: Mine never lasts that long so it’s not an issue but I would say not longer than an hour at room temperature because the pimento cheese contains perishable ingredients. Q: What is the best type of bread to use? 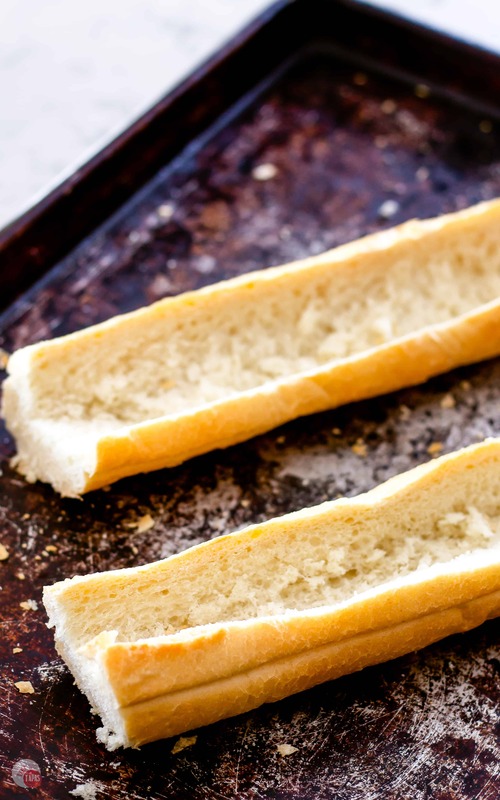 A: I prefer a crusty French bread but I would say any bread with a crispy crust for the texture and one in a shape that is easy to eat with one hand. Q: Is this Pimento Cheese Bread considered homemade? A: You can make all the ingredients from scratch if you are so inclined but I would say that even if you purchase all the ingredients at the store and assemble it at home then it is the very least, semi-homemade, which is still homemade in my eyes! Are you totally in love with this Pimento Cheese Bread recipe? Check out some other cheesy bread recipes that you can make for your next party! This pimento cheese bread is great for parties, or just staying in on a weeknight and need something for dinner to help soak up some “finally got the kids in bed” wine. Whatever the occasion, you need this sweet and spicy pimento cheese bread in your life! If you love this Easy Pimento Cheese Bread Recipe as much as I do, please write a five-star review, and be sure to help me share on Facebook and Pinterest! This sweet, spicy, and cheesy pimento cheese bread is great for tapas, or the main course, if you are so inclined! Slice bread lengthwise and hollow it out. Toast bread at 275F for 5 minutes or until inside is crispy. While bread is toasting, combine pepper jelly and water in a small saucepan. Heat until the jelly is melted and the water is combined. You can also do this in the microwave by mixing the jelly and water in a microwave-safe bowl and heat in intervals until melted and combined. Top each half of the toasted bread with pimento cheese. Spoon the warm jelly mixture over the pimento cheese. Crush the potato chips in your hand and sprinkle over the jelly. Cut across the loaf to slice into smaller pieces. Or you can just shove the whole thing in your mouth! The jelly is really for the sweet heat but it works really well. I hope you get a chance to try it! 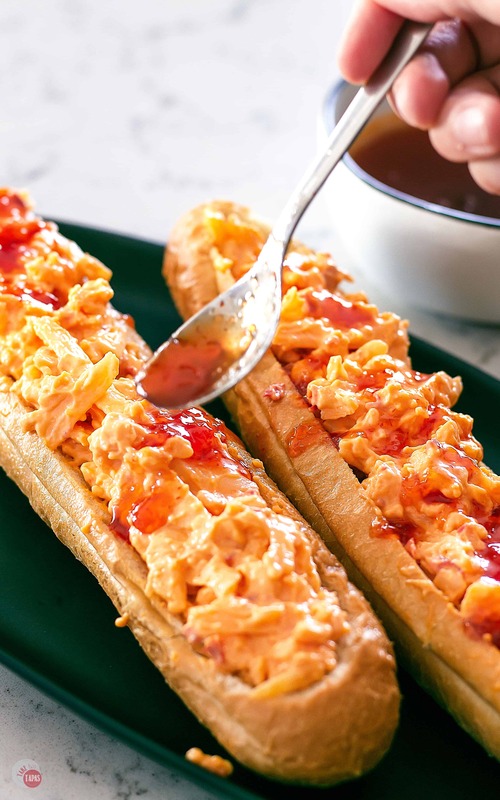 This looks so good, I love pimento cheese and it must go so well with that crusty French bread, yum! I love pimento cheese! I don’t eat it nearly enough! I think I need to try this for an upcoming Christmas party! You can use your own PC recipe and give it a whirl! Nothing beats Pimento Cheese. Looks so tasty! I. too, am a golf tournament convert! I really want to see the TPC at Sawgrass! This bread looks amazing. I love pimento cheese and pepper jelly but never thought to put them together. genius. Thanks! Luckily I know someone that works for the PGA so I have an “in” to the tourney with discount tix! Never! I think it was my lunch when I was making it for the photos! Wow this bread looks awesome! I LOVE pimento cheese so this absolutely perfect….yum! Yes, I could totally not be trusted at a golf tournament to not scream and shout! I actually get excited watching it on TV and am nowhere near restrained enough to be allowed at a live event. 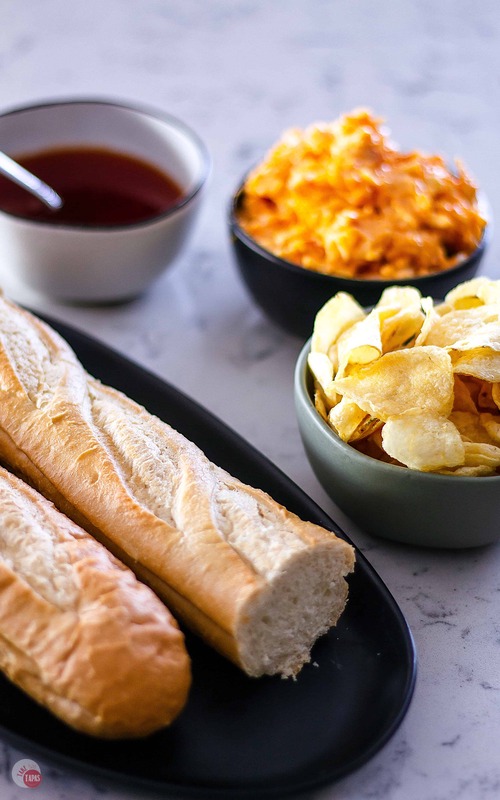 🙂 This pimento cheese bread looks like the perfect afternoon snack while watching a tournament. I know! I really need to just watch golf in my living room so I can be as loud as I want! Who knew you could get loud watching people stare down a ball?!?! YUM! I have some pimento cheese in the fridge right now and I will be doing this shortly! Just like me. I always pimento cheese and hot pepper jelly. I think I actually have 3 half empty jars of jelly! This sounds amazing!!! 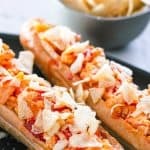 I have never had pimento cheese bread, but it is totally my style! So trying this! Oh man I love Pimento Cheese! And I love you carving out more of the bread for maximum cheese for every bite! Looks amazing! Thanks! I like crusty bread but I don’t like all that extra bread especially when I can fill it with something cheesy! Thanks for reading! 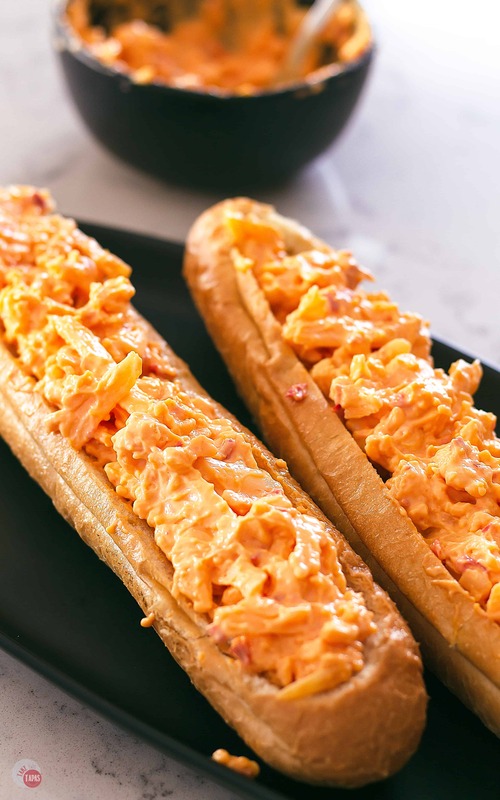 I loooove pimento cheese, and this recipe sounds amazing! Just loving the pepper jelly & chips – amazing!! Thanks so much! I fell in love with the crunchy chips and they mixed well with sweet and hot from the pepper jelly! I hope you get a chance to make it! Looking at these photo makes me super hungry!! This bread looks absolutely DELICIOUS !! Thanks for reading! The potato chips make this bread because they add that crunch! I can’t wait to see all your recipes! Love Pimento cheese! This combination sounds like a winning appetizer / snack for sure! I know you will enjoy it! It has everything from creamy, to crispy, sweet, spicy, and crunchy!